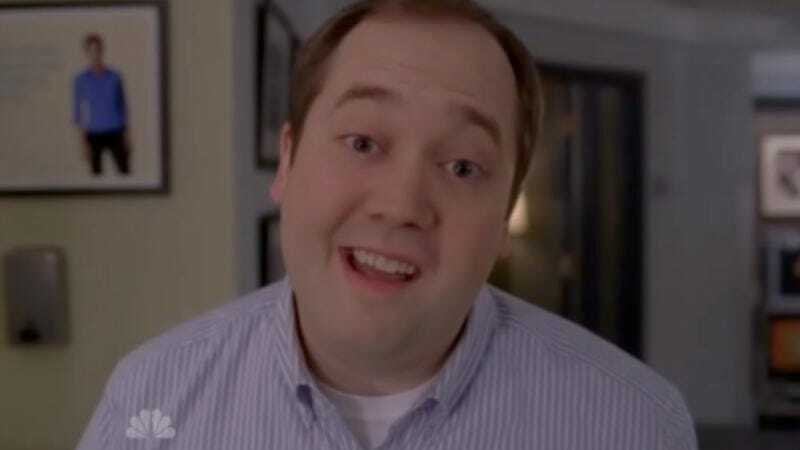 Going from being a test case for how much humiliation a human can withstand on 30 Rock, to doing that in real life, basically, 30 Rock's John Lutz will submit himself to a battery of psychological experiments for a new book, fittingly titled The Lutz Experiment. Lutz—who achieved a bachelor's degree in psychology before giving it all up to be an improv performer, Saturday Night Live writer, and eventually, embodiment of all that is pathetic about modern man—will return to his roots with the help of Stanford University's Jamil Zaki, who excitedly describes Lutz as "the perfect lab rat" in what sounds like a pretty good premise for a subplot on 30 Rock but is not, actually. Instead, it's a real thing, with Lutz submitting himself to various "basement testing rooms" in "different, weird parts of the country," where he'll undertake scenarios like those he's previously been put through for articles in Wired (where he confronted his fears of flying, snakes, and zombies) and Men's Health (where he and his wife, 30 Rock co-star Sue Galloway, were tested on the way they support each other). But even Lutz doesn't know what sort of things he'll have to do in The Lutz Experiment, though he tells The New York Times it's nevertheless fun to engage in thoughtful exercises like these, "rather than just knee-jerk reactions to eating pudding or dancing with a bra on." At this, Dr. Zaki let out a malevolent laugh and began prepping his "Inquiry Into The Male Response To Eating Pudding While Dancing With A Bra On."